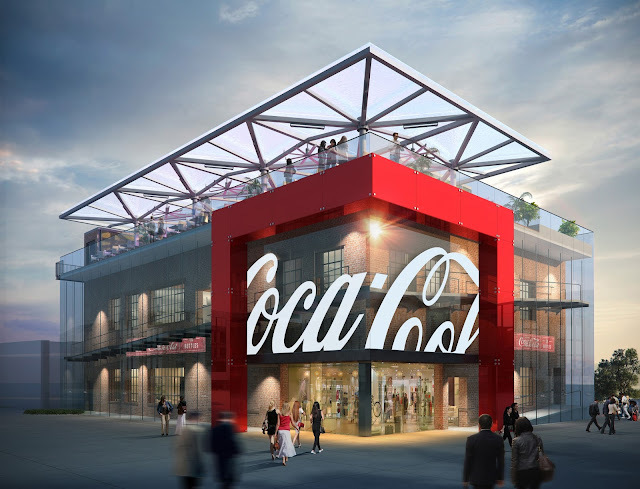 ORLANDO, July 1, 2016 – Coca‑Cola Store Orlando opens July 2 at Disney Springs, allowing guests to experience the world’s most iconic beverage brand at a new immersive retail destination. Just as Disney Springs is a one-of-a-kind Disney experience delivering great dining, shopping and entertainment, Coca‑Cola Store Orlando is uniquely designed to showcase Coca‑Cola branded merchandise and entertaining experiences that inspire the senses. Coca‑Cola Store Orlando is modeled after a 1920s Coca‑Cola bottling plant. Celebrating the history of Coca-Cola, the inviting brick exterior gives a nod to the brand’s heritage while the glass-accented entry pays tribute to the iconic Coca‑Cola green glass bottle. Inside, guests are welcomed by a 30-foot-wide blown-glass chandelier crafted from repurposed Coca‑Cola bottles – just one example of how this unique retail experience was designed with the environment in mind. The store – one of only three retail locations operated by The Coca‑Cola Company in the United States – features a broad assortment of Coca-Cola branded merchandise. A line of sustainable fashion apparel and other handmade items crafted from recycled materials showcase the 5by20™ collection – an array of items created by women artisans from around the world. Guests can visit the refreshing rooftop beverage bar and taste an ice-cold Coca‑Cola while taking in the sights of Disney Springs. For the ultimate Coke experience, guests can choose from a variety of Coca‑Cola brands from around the world such as Beverly from Italy and Thums Up from India, frozen beverages and over 100 drink choices via Coca‑Cola Freestyle®. A selection of specialty adult beverages is available in the evenings. “Coca‑Cola shares much in common with Disney, including our ability to inspire unique moments of optimism and happiness for our fans,” said Russell Jacobs, General Manager of Retail and Attractions at The Coca‑Cola Company. Beginning in August, guests can share a moment with the famous Coca‑Cola Polar Bear. Bear hugs, high fives and photos will all be welcome! Coca‑Cola Store Orlando is part of Disney Springs at Walt Disney World Resort. The store is located in Town Center, the district’s newest neighborhood where guests can find exceptional shopping and dining venues. Offering exclusive merchandise, unique experiences and true refreshment, Coca‑Cola Store Orlando provides the perfect way to cap off a discovery-filled day at Disney Springs. About The Coca-Cola CompanyThe Coca-Cola Company (NYSE: KO) is the world's largest beverage company, refreshing consumers with more than 500 sparkling and still brands and more than 3,800 beverage choices. Led by Coca-Cola, one of the world's most valuable and recognizable brands, our company’s portfolio features 20 billion-dollar brands, 18 of which are available in reduced-, low- or no-calorie options. Our billion-dollar brands include Diet Coke, Coca-Cola Zero, Fanta, Sprite, Dasani, vitaminwater, Powerade, Minute Maid, Simply, Del Valle, Georgia and Gold Peak. Through the world's largest beverage distribution system, we are the No. 1 provider of both sparkling and still beverages. More than 1.9 billion servings of our beverages are enjoyed by consumers in more than 200 countries each day. With an enduring commitment to building sustainable communities, our company is focused on initiatives that reduce our environmental footprint, create a safe, inclusive work environment for our associates, and enhance the economic development of the communities where we operate. Together with our bottling partners, we rank among the world's top 10 private employers with more than 700,000 system associates. For more information, visit Coca-Cola Journey at www.coca-colacompany.com, follow us on Twitter at twitter.com/CocaColaCo, visit our blog, Coca-Cola Unbottled, at www.coca-colablog.com or find us on LinkedIn at www.linkedin.com/company/the-coca-cola-company. Disney Springs is a one-of-a-kind Disney experience, treating guests by day and night to great dining, shopping and entertainment amid beautiful open-air promenades, flowing springs and waterfront charm. Offering an air of sophisticated grace and design that harkens to Florida’s waterfront towns at the turn-of-the-century, Disney Springs is home to four distinct, outdoor neighborhoods: The Landing, Town Center, Marketplace and West Side. Nearing completion in 2016, Disney Springs has been undergoing the largest expansion in its history to double the number of shops, restaurants and other venues for guests to explore, which will result in more than 150 establishments. Disney Springs is part of Walt Disney World Resort, the number one family vacation destination in the world, located in Lake Buena Vista. 0 comments to "COCA‑COLA STORE ORLANDO INVITES GUESTS TO SHOP REFRESHED AT DISNEY SPRINGS"
2019 Epcot International Flower & Garden Festival: Topiaries, Food, Music, & More! Star Wars Galaxy's Edge Opens at Disney World on August 29th! Copyright 2008 - 2019 Only WDWorld. All rights reserved.